Slip into something comfortable, but be warned. This regenerative and moisturizing body oil features the exotic, addictive scent of Monoi de Tahiti and the penetrating nourishment of Passionfruit Seed Oil. Our exclusive formulation, inspired by rich Polynesian culture and precious traditional ingredients, combines a unique modern delivery with the dangerously sensual afterglow of seductive fragrance. Smooth the oil over your skin, like fluid silk, and be transported. This distinctive body oil offers discriminating beauty and spa enthusiasts a combination of nourishing natural ingredients with the soul-stirring fragrance of Tahitian gardenia. Our South Pacific Beauty Oil was among the top finalists in an international formulation competition, conducted by the Institut du Monoï de Tahiti, in France. We're so proud!! 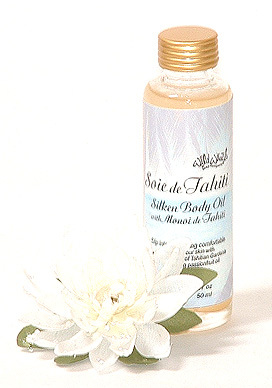 We take Monoi de Tahiti and combine it with the most moisturizing and nourishing exotic oils in the Pacific. The seductive fragrance of Tahitian gardenia in our Monoi de Tahiti, along with kukui nut oil, macadamia nut oil, virgin coconut oil, and vitamin E make up this versatile oil. Use it directly on your skin after a bath or shower, add a few drops to your bath, or try it for massage. Some of our customers use it as a light, exotic perfume. A little goes a long way! As those not on a tropical island may have noticed, our fabulous oil naturally solidifies in cool climates. Just place the container in hot water to liquefy. We offer a choice of either bottles (for squeezing) or jars (for scooping). Just what your hands have been begging for. We've improved our formulation, and the result is getting great reviews! 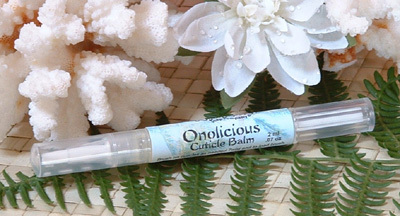 This new cuticle balm is a nourishing blend of mango oil, papaya oil, tangerine butter, Monoi de Tahiti, passionfruit seed oil, shea butter, banana extract, and our popular coco-mango Onolicious scent. Brush on to pamper and soothe your cuticles with the pen-style applicator, and discover for yourself what all the fuss is about! Take a look at the complete Onolicious Tropical Manicure. your ship has come in. Sensual cocoa absolute, sweet orange, and soothing sandalwood essential oils in an exotic massage oil. A cocktail of rare tropical oils, including passionfruit seed and virgin coconut oil, fragranced with the seductive scent of cocoa beans and ripe oranges will show you why this is known as an almost dangerous aphrodisiac. Looking for an exotic massage experience? Try our internationally recognized South Pacific Oil . Luxurious and nourishing moisture for after shower or bath. This soothing oil soaks in quickly, leaving your skin smooth and lightly scented with sweet honey, milk and oatmeal. A soothing and unique juxtapostion of familiarity and new beginnings. This nourishing body oil is rich in vitamins, minerals, proteins, and antioxidants for radiant, healthy skin. Give yourself the gift of Renewal in this revitalizing blend of rice bran and grapeseed oils, scented with our popular oatmeal, milk and honey combination. 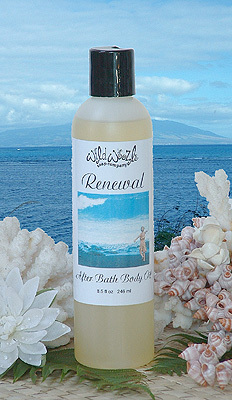 For more of this fabulous fragrance, try Renewal Lotion and Renewal Soap. 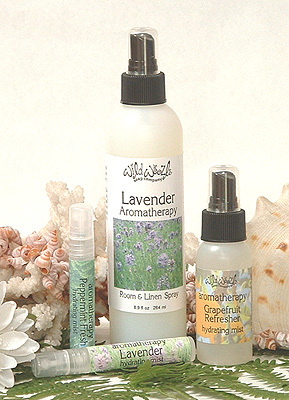 Bring the power of aromatherapy to your skincare and your living space. Room and linen spray is available in 8.5 ounces; our hydrating face and body mists are available in 2.2 ounces and a take-everywhere 9.5 ml spritzer. 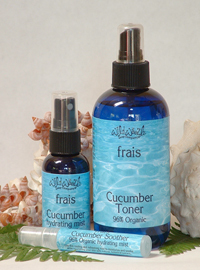 This perfectly refreshing all natural moisturizing spray and facial toner is infused with pure Cucumber Hydrosol. With natural anti-inflammatory properties, this toner closes the pores, adjusts the pH of the skin, and removes any remaining cleanser or dirt from the skin. Keep your skin hydrated throughout the day, during air travel, hot weather, and any time your skin needs a boost. The rising star of our Sea of the Moon Skincare System. This spray is part of our exclusive Mint Mocha Pedicure. Wild Woozle Soap Company is proud to support breast cancer research with our donations of Sweet Feet Peppermint Foot lotion and Cooling Foot and Leg Spray, from our Mint Mocha Pedicure Collection, for fundraising and for participants in the American Cancer Society's Relay for Life. Join the fight! Make a donation at the ACS website. Use this sweet and sassy mist to revive and refresh while hydrating your skin with the essence of summer. Perfect for layering with our Pink Lemonade Body Creme. If you love lilac, fear not! This is the real deal. Clean, fresh, just enough sweet, and pure Spring. Find Lilac Obsession Soap in our Luxury Soap Collection.